Brussels Sprouts are a type of cabbage, and are closely related to non-heading varieties such as kale, collards, and borecole. They share many of the same nutritional characteristics, and are great sources of vitamin C and many of the B vitamins as well. They are a powerhouse source of vitamin K1, the vitamin responsible for blood clotting and helps maintain liver health. Combine Brussels sprouts with whole grains and get a complete protein–a half cup of the green guys gives you 2 grams of protein! They are anti-inflammatory and contain glucosinolates making them lower your risk of cancer and healthy for your heart. When purchasing fresh Brussels sprouts, look for buds still on sturdy stalks, and any remaining leaves should be little wilted as possible. During autumn, when local ‘sprouts are at their peak, the entire stalk can be roasted on the grill, by brushing with oil and a little balsamic vinegar. When purchasing packaged ‘sprouts, look for uniform bud size to ensure even cooking. Overcooked Brussels sprouts will turn grey and emit an odor that has caused many to avoid this exceptional vegetable. Older cookbooks often called for boiling or braising, which do nothing to improve their flavor. Today, oven roasting and stir-frying produce tasty results. Or, try them raw. Bon Appétit Magazine recently included this recipe for Broccoli-Brussels Sprouts Slaw on their website at http://bit.ly/1W3jaRh. 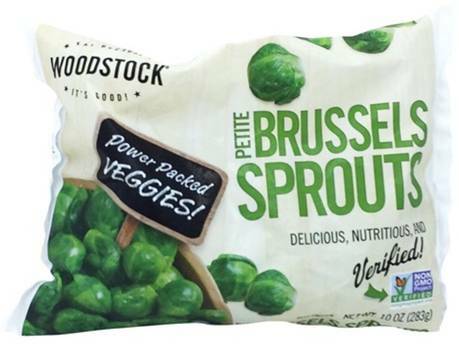 While Brussels Sprouts are not available to us fresh currently, the Woodstock Farms frozen Petite Brussels Sprouts are on sale for just $1.99 thru Tuesday, January 19th! Find more recipes at our Co+op, Stronger Together page including Brussels Sprouts with Pomegranate Glaze, Slivered Brussels Sprouts with Bacon and Maple Syrup, and Orange Glazed Brussels Sprouts. How you like them sprouts?